Peter said always be prepared to give an apologetic, for the hope that is within you, and do that with gentleness and respect [1 Peter 3:15]. Apologetics has a broad sweep of two central concepts, giving an answer and giving an explanation. It clarifies truth claims. It does not make your answers confusing and difficult. You have to come to the level of the questioner, because more than answering a question, you are always answering a questioner. Somebody is behind that question, and if you answer the question without answering the questioner, you may come through as being very knowledgeable, but you've really not been persuasive to the one who is looking for the answer. The power of the gospel is that it is true. Historically true. Objectively true. Ultimately true. The gospel (what Jesus taught and did) is not true because we want it to be, but is true because it lines up with reality. There should be no surprise that great amounts of evidence, solid arguments, good reasons, and excellent explanations are available to anyone who looks, to justify the hope in Jesus within us. Not thinking that this matters or that it can make a dramatic difference to people inside or outside the church represents a failure in recognizing human nature and how we are designed by God. God made us to care about the truth. Interwoven throughout Scripture is the principle that seeking the truth is virtuous, good, and ultimately leads to faith in Jesus. God did not make us to be an uncritical, superstitious bunch of fools. He does not look favorably on magicians and mystics or those who fall for their schemes. It is not reason that is taking away my faith: on the contrary, my faith is based on reason. It is my imagination and emotions [that causes me to lack faith]. The battle is between faith and reason on one side and emotion and imagination on the other. Put another way, we use good teaching to combat false teaching. We expose heresies through explanation and giving evidence. We defend the truth with all these things while being guided by the Holy Spirit (1 Corinthians 2:12-13). The hearts and minds that God gave us yearn to grasp and understand the truth in all areas. Who of us, except for sinful and corrupt reasons, would actually prefer a lie over the truth? The ability to reason, answer questions, and explain are all gifts from God. Curiosity and the desire for evidence and explanation are not inherently evil. In fact, they can be a virtuous thing. People's desire for evidence and explanation may actually be the Holy Spirit awakening a love for the truth in them. Not every skeptic or doubter is necessarily a hater of the truth. I hope so far you are in agreement that the truth matters, and that humans were made to care about what the truth is. I want to spend some time talking about whether living out 1 Peter 3:15 really works. When Christians are prepared to give good answers and explanations that the questioner can understand, does it work? 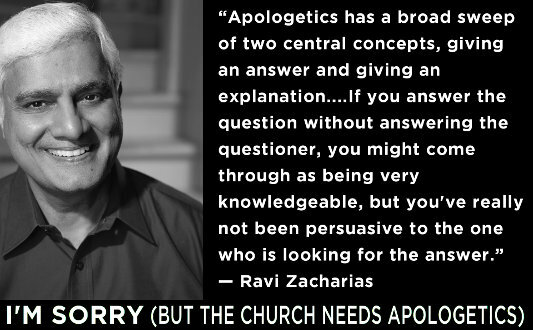 Put another way, does apologetics help to lead people to a vibrant, strong faith that bears fruit in Heaven? I say yes. The best evidence for me on a personal level, are the changes that studying apologetics have brought into my own heart, mind, and life. I have never been more passionate or amazed by the love of God and what Jesus did on the cross. Another important evidence is the impact that apologetics has had on God-loving people throughout history: C. S. Lewis, Joy Davidman, G. K. Chesterton, Ravi Zacharias, William Lane Craig, Greg Koukl, John Lennox, Josh McDowell, and on and on. These dramatically changed lives for Jesus and their stories bear great witness to the power and importance of God-led apologetics. A comparison could be made to whether prayer or reading the Bible is effective. The best evidence is the changed lives. Why would we accept good evidence in one category, but not in another? The body of Christ, the church, has many varieties of differing passion. But all of us, out of respect and love for the other parts, ought to be careful not to be dismissive or unappreciative of the parts of the body we are not as naturally passionate about. In addition, all of us should be willing and prepared to be trained up and to serve in the other areas as it best serves God's purposes. I am not a musician, but if I can serve God at a camp by slapping some spoons together to a rhythm, I will do my best! For those who have not yet learned the valuable role of apologetics in their Christian life, I wonder if it is for the same reason that some have found little value in reading the Old Testament. Perhaps in both cases no one has gently and respectfully offered good answers as to why the time should be invested in it. Or perhaps a convincing explanation has not been given. If apologetics at its most basic is giving good answers and explanations about Christian beliefs and values, it can hardly be avoided by any Christian wanting to help bring others to trusting faith in Christ. What should be the motivation behind everything a Christian does (including studying apologetics)? Love, of course! Love for God first, and love for others next (Matthew 22:37-40). God has used a desire to study apologetics to change me. I love people more than I ever have before, and I want them to know what God did for them on the cross. There are so many lost and broken people in this world looking for answers to the questions weighing them down. There are many educated, intelligent, loving, and kind atheists, silently desperate for a good explanation for the joy and hope they see in Christians. We must not forget the poor, the hungry, the widows and the orphans. But who has God put into your life to influence? If the poor, out of love give resources. If the hungry, out of love give food. If the skeptics, agnostics, atheists, or doubters, out of love give reasonable answers and good explanations that they can understand. In this way, studying apologetics can be a great act of love. Nathan Lau lives in Calgary, AB with his wife Joyce. He has been a registered nurse for 10 years, and is currently working as a instructor at a college in Calgary. He has been involved in various church ministries since he was a teen, and currently serves as a Bible study leader. Seven years ago, he stumbled upon C.S. Lewis' Mere Christianity and Jesus Among Other Gods by Ravi Zacharias. God used those two books to spark a fire that would lead him for the first time in his life, to truly believing with all his heart, soul, strength, and mind (Luke 10:27), that belief and trust in God and Jesus is the most reasonable position a human being can take. Ravi Zacharias, "A Fish Out of Water, Part 1 of 2," podcast, Let My People Thnk, August 29, 2015, accessed September 16, 2015, http://rzim.org/let-my-people-think-broadcasts/a-fish-out-of-water-part-1-of-2. Scripture citations are taken from the New International Version (NIV). C. S. Lewis, Mere Christianity (New York: HarperCollins, 2001), 139.